On the back of a six month dry spell due to the ENSO cycle and a climate change intensified heat wave, the scorching heat of Sydney’s hottest ever recorded day evaporated away much of the water in the dam. With just a few inches left in the dam, no more was available to pump up to the irrigation header tank – all that was left was water too oozy and muddy to pump, and anyway the frogs needed something to keep their chorusing throats wet. The irrigation for the veggie patches got switched over to tank water supply, not ideal but better than having all the effort and resources put into the veggies going to waste because they’d dried out under the hot sun. The tanks are our water supply for all domestic uses, plus fire fighting and general (non plant) garden use. If the tanks run dry we would have to buy water in; something we’ve never had to do in the past and hopefully won’t have to in the future. Water trucked in comes with a relatively high financial cost per litre (well, especially when you’re not paying anything for the water you collect yourself), a high environmental cost (processing and transport), and has the added taste disadvantage of being town, chlorinated water. Just as the summer school holidays are coming to a close however Tropical Storm Oswald has hammered far North Queensland with rain and wind, flooded Brisbane and the surrounding suburbs, whipped up the oceans with shore battering energy, and is slowly making its way down South to share the joy before drizzling itself out somewhere South of Sydney in a few days time. 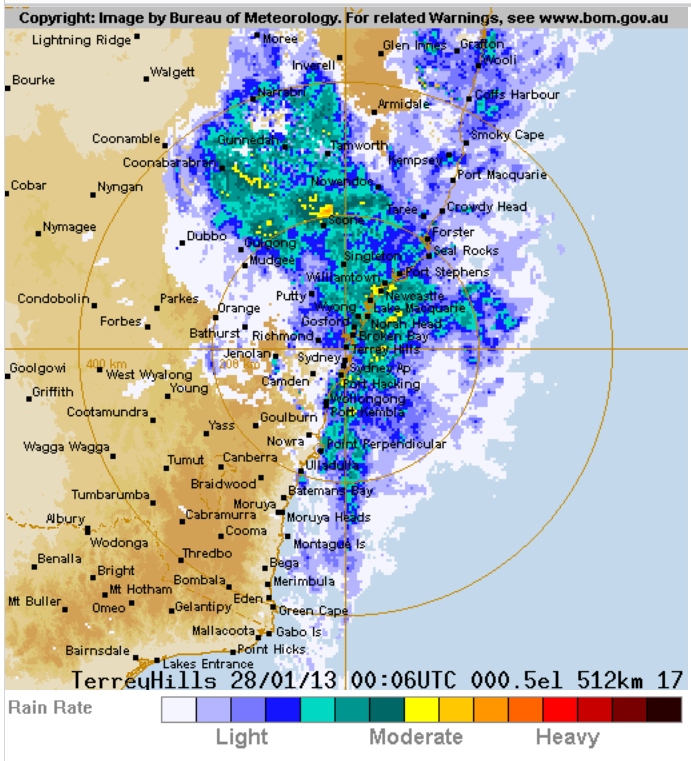 Just above the target’s bullseye of the rain radar map you can see Gosford labelled, whilst slightly up and left you can see Putty. ridgesong lies roughly halfway between these two markers and boy, are we appreciating Oswald’s legacy. Just before the first of the rain hit we did some water management, moving water from the garage tank to the (more heavily and regularly used) house tank, in order to ensure that both tanks had space to collect more rainfall. After all, there is no point getting rain if your tank is already full and it’s all just pouring down the side. After spending the weekend boating on the Hawkesbury we returned home last night to find both tank’s overflowing and the dam level about 15cms higher than before. Not bad at all. This morning, with another 80mm to 100mm of rain due I groomed the slope leading to the dam with a hoe and shovel to ensure that we maximise the water flow from the drive at the top of the hill (in front of the neighbour’s house) into the dam. Meanwhile I pumped some water (approx. 10,000L) up from the house tank to the already full garage tank, causing it to then overflow into the dam. That put another 10cms or so of level into the dam. We expect that by tomorrow morning, once the storm has expending itself, the house tank will again be overflowing. To put all this into perspective, by the time this storm system passes us we will have collected approximately 25,000L of water. Lots of people are suffering because of Oswald’s fury, and at least one person has lost his life, but down here in our little patch of the Earth we are very grateful for the rain. Collecting your own water makes you exceedingly conscious of how much you use, and very mindful that rainy days are more than a reason to grumble and moan about being stuck inside. Climate predictions point to a drier future for Australia as a whole, so collecting water while the rain falls is not just a simple distraction from the grey drizzle on a rainy day, it is life and opportunity while we can enjoy it and something that will become only more important as time goes on. This entry was posted in GARDEN, Practical stuff by Simonperry. Bookmark the permalink.